Home Button Repair - Contact point? Hello. When i was fixing my iPhone 5 screen, one of the contact points for the home button near the lightning connector broke off. what i was wondering would i be able to get a new lightning connector flex cable assembly to fix that? Thanks! iFixit does sell the lightning connector and headphone jack assembly. And this assembly includes the 2 home button contact pins. This is the part that you should be replacing. You just can't see those pins on the picture because they are on the other "side" of one of the flat cables. One additional note: you can source the assembly from suppliers other than iFixit for a cheaper price (down to $10), however this is a critical spare part that may fail often if poorly made, also may adversely affect the battery, the logic board, the charger and the lightning cable. Consider this before buying a cheap connector. can this piece go on a 5 and a 5c? like do a 5 and 5c take the same piece ? @lulneisha14 iPhone 5, 5S, and 5C each have a different port, although they are all similar in aspect, price, and perform the same basic tasks. You need to be sure what cable you've broken. If it's the cable of the lighting connector or the home button cable you need to replace the whole part. If you want to fix it on your own you need to buy the whole part and replace it by following the steps on the guides there are on ifixit. In both cases the replacement parts are cheap if you search over the internet. Its attached to the speaker. If you want to fix it change the whole part as it's present on the image you've send me. The flat cable holding the 2 pins is connected to the dock connector. The loud speaker may and may not be part of that assembly. 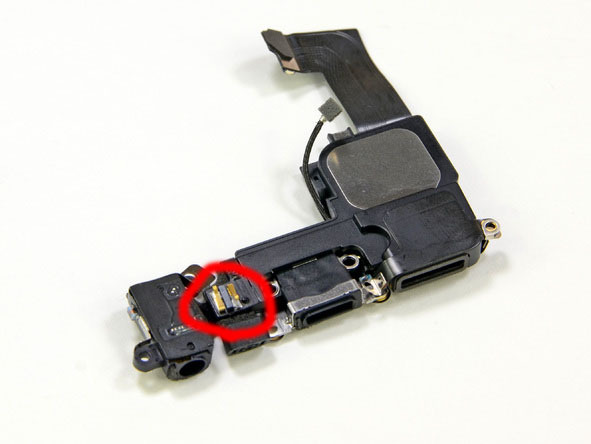 It is best to keep the original speaker that came in the phone (always keep original parts when possible), and replace only the "lightning/dock connector flat cable assembly." I had the same problem and it basically fried the components that belong to the home button so I had to replace the whole lightning assembly dock, You will no longer have use of your phone but you can fix it temporarily until you can buy the Lightning dock component. What you need to do is plug the phone in to a power source and ask Siri to open settings, from there find assistive touch and enable. This will give you a makeshift button that will stay on screen and you can move it around. You can use this button as if it's the home button until you get the replacement parts.